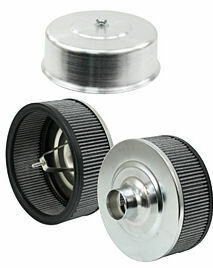 Off Road filter assembly comes as seen with 10" spun aluminum hat. These filters fit stock 30 & 34 pct carbs (2") and 2 5/8" neck carbs. Replacement filters also available. Click options to choose yours.